As an enthusiastic change agent, Patti Maggiora enjoys drawing out the best in others to fulfill their God given purposes. She encourages people with common interests to partner for community change. Patti has worked in public, private and non-profit sector settings finding creative ways for diverse organizations to partner on large scale community transformation efforts. Her most notable recent work has helped change vacant green spaces into usable vegetable gardens. Patti has contributed directly to establishing gardens serving over 200 families in Vancouver, Washington contributing to local food security. She and her husband Mark Maggiora are co-founders of Americans Building Community, a 501c3 non-profit organization dedicated to revitalizing the 4th Plain Corridor in Vancouver, Washington’s since 2008. They “transform neighborhoods, one heart at a time.”Patti is a Partner and Program Manager for Transformation Systems International, LLC. She manages both the Catalyst and FLEX programs and has been a member of the Performance Center since 2002. 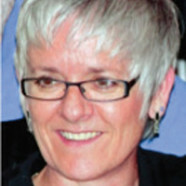 Patti attended the University of Alaska, Anchorage and the University of Oregon, Eugene.